It’s often difficult to capture a range of different events, that occurred at different times that have contributed to growth of a region. More normally, we see single themes such as how industry has developed, or how transportation networks have developed. We then have to piece together an overall view. 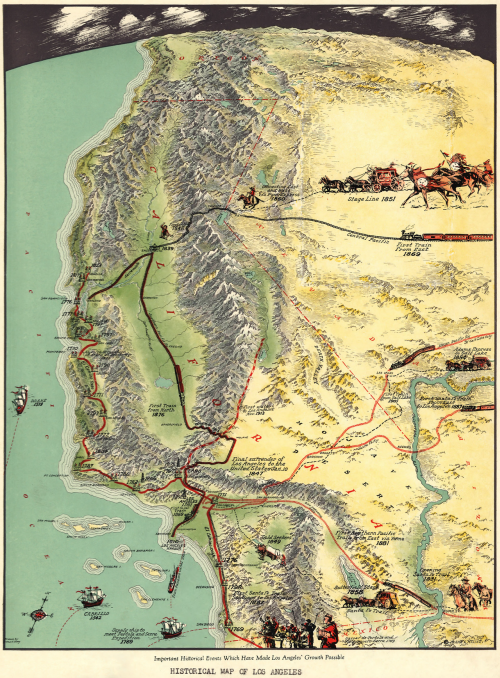 This map of the early 1900s does things a little differently and presents 20 or so major events that led to the growth of Los Angeles. There is no indication of time other than the labels that accompany different vignettes. The map, then, explains the historical development as a collage of events that happened at different times but which collectively have their place in the historical context of the city. The map makes good use of a progressive projection that curves away from a plan-oblique at the foot to an oblique view at the horizon. This gives a way to accentuate and focus on the study area as well as highlight the importance of Los Angeles by making it larger in relation to the rest of the layout. There’s a good amount of detailed topographic detail, particularly the mountain ranges beautifully depicted along with lush valleys and barren desert. The vignettes occupy space sensibly and are made to fit the available space. For instance, the Stage Line of 1851 is shown relatively large not because it was necessarily more important but because the desert has no other defining detail…so it is used as a space-filler as much as anything. The vignettes are well drawn, mostly as side elevations, and create a certain dynamism to the map showing a region of growth and importance. Railroads are clearly represented and the typographic components sit well on the landscape. Eddy uses a great deal of artistic license but does so to a high standard. An illustrative map that tells a simple story. This entry was posted in MapCarte and tagged artistic, historical, illustrative, MapCarte, progressive projection by @kennethfield. Bookmark the permalink.